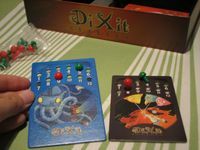 Subject: What's the difference between regular dixit and odissey besides the max players number? are there any relevant differences? The Odyssey one has scoring board that you can take out, I think it has some pipework art on it... and for woting you get your own tile with numbered holes and pegs. Haven't played the Odyssey one, but I think there are not any relevant differences. The pictures on the cards are different. If you're playing 7+ players then you can pick one or two cards instead of one, but you get less points for picking the correct card if you pick two. This. I don't find that any of the artists outside of Cardouat create cards with enough oomph to them in order to play with the same cards over and over again. The way voting is done is so different that I strongly suggest viewing Odyssey as an expansion only. Although very useful one because the board is much better. 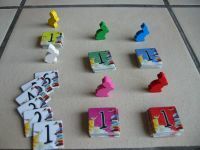 In the base game, players get six chits numbered 1 through 6 which are used for secret voting. In Odyssey players are handed a little board with holes where you push a little peg in to indicate what you vote for. For one, this makes scoring a bit of a nuisance because these boards are bigger and can't be put next to the pictures. The other thing is that when you place the boards on the table face down, you can actually still tell what people voted for!